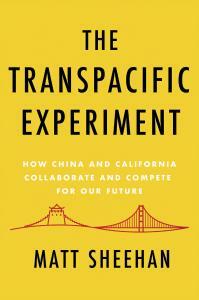 A timely, vital account of California's unique relationship with China through the exploits of the entrepreneurs, activists, and politicians driving transformations with international implications. Tensions between the world's superpowers are mounting in Washington D.C. and Beijing. But between these hubs of high-level politics, an entirely new reality is emerging. The People's Republic of China and the state of California maintain robust and interdependent socio-economic exchanges that reverberate across the globe, and these interactions make California a microcosm of the most important international relationship of the 21st century. In The Transpacific Experiment, journalist Matt Sheehan?The Huffington Post's first China correspondent?chronicles the real people who are making these transpacific connections. Sheehan tells the story of a small-town Southern Californian mayor who believes a Chinese electric bus factory will save his town from meth labs and skinheads. He follows a celebrated Chinese artificial intelligence researcher who leaves Google to create a Chinese startup, challenging his former employer from behind the Great Firewall. Sheehan joins a tour bus of wealthy Chinese families shopping for homes in the Bay Area, shedding light on disgruntled neighbors and raising important questions about California's own prejudices and perceptions of immigration and the American Dream. Through Sheehan's on-the-ground reporting, these up-close-and-personal narratives move from movie sets in the "Hollywood of China" to San Francisco housing projects, to Chinese immigrants who support Donald Trump. Each of these stories lays bare the new reality of 21st century superpowers: the closer these countries get to one another, the more personal the frictions become.